Ealing Broadway is a National Rail and London Underground station in Ealing, west London. On the National Rail network the station is on the Great Western Main Line, 5 miles 56 chains (9.2 km) down-line from London Paddington and is situated between Acton Main Line and West Ealing. The station and the main line trains serving it are currently operated by Great Western Railway. 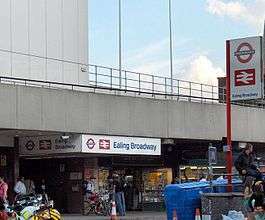 On the London Underground, Ealing Broadway is one of three western termini of the District line, preceded by Ealing Common, and it is one of two western termini of the Central line, preceded by West Acton. It is in Travelcard Zone 3. The Great Western Railway (GWR) opened its pioneering broad gauge tracks through Ealing Broadway between Paddington and Taplow on 6 April 1838, although Ealing Broadway station did not open until the following 1 December. As the only station in the area when it opened, it was initially named 'Ealing'. but was renamed Ealing Broadway in 1875. District Railway (DR, now the District Line) services commenced on 1 July 1879, when the DR opened a branch from Turnham Green on its Richmond line. The DR built its own three-platform station to the north of the GWR one, although, following the installation of a connection between the two railways to the east of the stations, DR trains also served the GWR station from 1 March 1883, on a short-lived service running to Windsor and Eton Central station, which was withdrawn as unremunerative on 30 September 1885. It was also intended to use the connection for a service to Uxbridge Vine Street station (via West Drayton), but this was never introduced. Following electrification of the main District line route through Ealing Common to South Harrow in 1903, the section to Ealing Broadway was electrified in 1905, and the first electric trains ran to Ealing Broadway on 1 July 1905. The original brick-built DR station was replaced with a stone-faced building sometime between 1907 and 1916. Prior to World War I, plans were made by the GWR to construct a new, mainly freight, line between Ealing and Shepherd's Bush, to connect west-to-south with the West London Railway. The Central London Railway (CLR, now the Central Line) would use the line by extending its tracks the short distance north from its terminus at Wood Lane (now closed), to meet the new GWR tracks. CLR services to two new platforms at Ealing Broadway, built between the GWR and DR stations, started on 3 August 1920, with, initially, just one intermediate stop at East Acton. The line also carried GWR steam freight trains until 1938, when the links at Ealing Broadway and west of North Acton were removed, and the line was fully transferred to London Underground. Originally separate companies, by 1920 the DR (by then known as the District Railway) and the CLR were both owned by the Underground Electric Railways Company of London (UERL). Despite this, the CLR services operated via the GWR station building, not the Underground one. The GWR-built station was demolished in 1961 and replaced by a low concrete structure containing shops and a ticket hall, with a high-rise office building above. The new station building serves all the lines, and the separate District Line station ticket hall was closed, although the building remains, and the original station facade is now the entrance for multiple shops. On Platform 9 (District line) there are some roundels of a style dating from c. 1908, three of which are replicas made in 1992. On 16 November 1937, a steam railcar overran signals and crashed into the signal box. On 20 December 1973, an express passenger train was derailed when an unsecured inspection door on the locomotive hauling it struck point rodding, causing a set of points to move under the train. Ten people were killed, 94 were injured. On 23 June 2015, a woman aged 36 and her 16-year-old daughter were killed at Ealing Broadway station at 18:10 BST. They were killed when they fell in front of a First Great Western Intercity 125. The investigation into the incident is still ongoing, and British Transport Police have stated that the deaths are not being treated as suspicious. The identities of the deceased have yet to be released. four National Rail (platforms 1 to 4). Trains do not stop at platforms 1 and 2, except during engineering works or other disruption. Platforms 1 and 3 are on lines leaving London, while 2 and 4 are on lines into London. Most of the National Rail platforms are open to the elements, although there are some waiting rooms on each platform. two Central line (5 and 6), which have a shared awning canopy. three District Line (7 to 9). District Line platforms 8 and 9 are partially covered by a short canopy, and retain a number of examples of early solid-disc Underground signs, used before Edward Johnston designed the familiar roundel in 1919. All platforms are accessed through a gateline of ticket barriers. National Rail services are provided at the four Great Western Main Line platforms by Great Western Railway and Heathrow Connect. 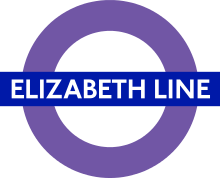 London Underground provide services to the three District line and the two Central line platforms. London Buses routes 65, 112, 207, 226, 297, 427, 483, 607, E1, E2, E7, E8, E9, E10 and E11 and night routes N7, N11, N83 and N207 serve the station. Construction of a new canopy on platform 4. The West London Business group backs a Surbiton-to-Brent Cross light metro tube line, called the West London Orbital underground railway, based on Copenhagen Metro technology, which would include a station underground at Ealing Broadway. The London Borough of Ealing does not support the proposal, saying "no consensus to progress this project [due] to extremely high costs". The London Group of the Campaign for Better Transport published a plan in 2008 for an off-road orbital North and West London Light railway (NWLLR), sharing the Dudding Hill Line freight corridor, and using the middle two of the six track beds at North Acton. In April 2009 Ealing Council voted to call on Transport for London to look into the proposal. 1 2 3 4 5 "Multi-year station entry-and-exit figures" (XLS). London Underground station passenger usage data. Transport for London. April 2016. Retrieved 3 May 2016. 1 2 Connor, Piers (1993). "The District Looks West". Going Green: The Story of the District Line. Harrow Weald: Capital Transport. pp. 14, 16. ISBN 1-85414-157-0. ↑ Day, John R. (1963). "The Metropolitan District and the Inner Circle". The Story of London's Underground (1st ed.). Westminster: London Transport. pp. 24–25. ↑ Demuth, Tim (2004). "1881-1890". The Spread of London's Underground (2nd ed.). Harrow: Capital Transport. pp. 8–9. ISBN 1-85414-277-1. ↑ Clarke, Hedley (2007). Underground Bullseyes 1972-2000. Colchester: Connor & Butler. pp. 6, 7, 50. ISBN 978-0-947699-40-6. ↑ Leboff, David (1994). London Underground Stations. Shepperton: Ian Allan. p. 42. ISBN 0-7110-2226-7. ↑ Trevena, Arthur (1980). Trains in Trouble. Vol. 1. Redruth: Atlantic Books. p. 41. ISBN 0-906899-01-X. ↑ Vaughan, Adrian (1989). Obstruction Danger. Wellingborough: Patrick Stephens Limited. pp. 235–38. ISBN 1-85260-055-1. ↑ Vialls. "Mother and daughter killed by train at Ealing Broadway". BBC NEWS. BBC NEWS. Retrieved 25 June 2015. ↑ "Capital's key services protected, says Johnson". The Press Association. 20 October 2010. Retrieved 21 October 2010. ↑ Russell, Michael (7 October 2009). "Boris faces calls to improve Ealing Station". Ealing Gazette. Trinity Mirror. ↑ "Crossrail Station Design Contract Awarded". Crossrail. 17 May 2011. Retrieved 13 May 2012. ↑ "Chapter 22 Route window W5 Ealing Broadway station". Crossrail. Retrieved 13 May 2012. ↑ "West London Orbital 2008 Update" (PDF). February 2008. Retrieved 13 May 2012. ↑ "LIP Public Consultation Meetings". 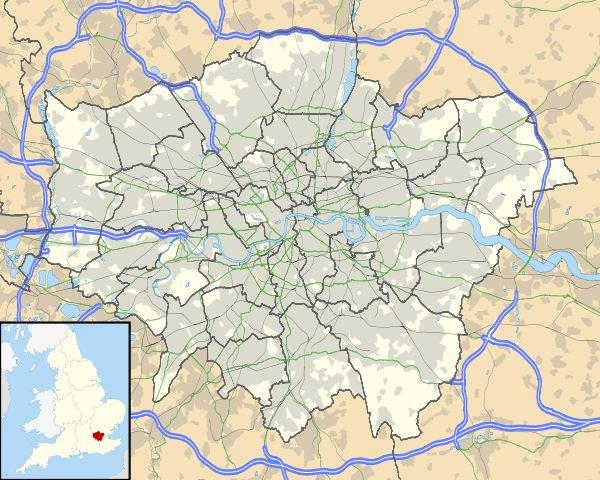 London Borough of Ealing. 7 June 2011. Retrieved 13 May 2012. ↑ "Notes Of Council Meeting - 21st April 2009". Ealing Council. Retrieved 24 November 2013. Wikimedia Commons has media related to Ealing Broadway station.